I’ve noticed that there are a lot of recipes out there for roasted chickpeas, but I had never tried any of them myself. At first I thought I would make them and they would be a great gluten free topping for salads in place of croutons, and they would. It took me several tries to get this recipe right and the final one ended up to be sweet instead of savory like I had originally intended. Once the chickpeas become crisp they have a completely different flavor than they do when you eat them freshly cooked. I added some sweet spices that I felt would go well with this holiday season, especially since October and November are my favorite times of year! I’ve been craving cinnamon, cardamom and nutmeg and the house smelled so good afterwards. Once the final result came out of the oven and we started munching on these crunchy treats, I decided they stood on their own as a snack food and not for the top of a salad like I had first thought, although that would work well too! While the oven is preheating, rinse chickpeas thoroughly so all of the juice from the can is off and you are left with clean beans. Once the oven is preheated, place the chickpeas in an ungreased baking sheet. There’s no need to dry them as they will dry out pretty quickly in the oven. Place in the oven for fifteen minutes, shaking halfway through. By the time the fifteen minutes is up, your chickpeas will appears very dried up and even starting to crack a little. This is what you want! While the chickpeas are drying out in the oven, melt the coconut oil. In a separate bowl combine the spices and mix well so they will be evenly distributed on the beans. When the beans come out of the oven, pour the coconut oil on them, making sure they are completely covered, then sprinkle on the spice mixture. Toss very well so the oil and spice mix are thoroughly covering the beans. Place back in the oven for 30 more minutes, tossing halfway through. When the chickpeas come out of the oven they will be toasty and sizzling in the oil. Let them cool and serve immediately. Don’t place them in the refrigerator or they will become soggy. If left out, they will stay a crunchy and delicious snack! Even though it’s August and therefore very hot outside, sometimes I still crave soup. I figure people in hot climates all over the world eat soup year round so why should I be any different. Usually my favorite soups contain coconut milk and some kind of curry. I’ve never had a curry I didn’t like. I even had curry at a Chinese restaurant the other day when I was visiting my Aunt in Los Angeles. I don’t think I’ve ever had Chinese curry but it was amazing! In fact, I may have to attempt one of my own. One of the nice things about LA is the number of truly authentic ethnic restaurants. I miss having that amount of good food around every corner. So here I am sitting in my very hot, non air conditioned apartment, thinking about curry. I have a can of coconut milk in my pantry, some vegetable broth and chickpeas. In my fridge I have garnet yams and some tomatoes on the counter that are about to become over-ripe. So what do you do when you have different ingredients and something that needs to be used before it goes bad? You make soup! Here’s my version of an Indian curry soup that I made with some super yummy Indian curry powder that I got from work. Heat coconut oil in a large sauce pan on medium high heat and add garlic and onions. Cook until onions become translucent and mix in ginger until aromatic or for about 30 seconds. Add bell pepper and jalepeño and cook for another couple of moments or until the bell pepper is soft. Pour in vegetable broth, coconut milk, chickpeas, yams and tomatoes and bring to a boil. Once it comes to a boil, stir in curry and salt and reduce to a simmer. After about ten minutes the yams should be soft and cooked through, if they aren’t, keep it simmering until the are done. Serve with cilantro to garnish! Two years ago I didn’t even know what jackfruit was. My first experience with this versatile fruit was at a vegan restaurant that I worked at. We made jackfruit tacos, enchiladas, soups and we even used it to substitute seafood like tuna or crab. Since then I have moved on to working in another kitchen that doesn’t offer jackfruit as a vegetarian option and usually uses only tempeh or tofu. So when we had a taco day the other day and had tempeh once again, I started dreaming of the jackfruit tacos I used to eat so often. The meat option that day was carnitas, so I decided to go home and make some carnitas of my own with the two cans I jackfruit I had in my pantry. If you can’t find jackfruit at your regular supermarket in the Asian section or with canned fruits or vegetables, you will always be able to find it at any Asian supermarket. Jackfruit is originally from India and Southeast Asia but is also very popular in Brazil and other South American countries. It is the largest fruit in the world and can grow to be 80 pounds. I haven’t personally had a ripe or fresh jackfruit but I hear it tastes like Juicy fruit, Yummmy! For savory dishes you want to make sure you buy the green fruit in brine. When you open the can and strain it you can either break it apart with you fingers for a very shredded look or you can just break it up in the frying pan with a sharp spatula. As it warms up it will become easier to break apart. Here is my recipe for jackfruit carnitas. I tried to keep it as authentic as possible to the original pork recipes by simmering it in orange juice. Not only is jackfruit super low in calories, you also don’t have to spend hours cooking it on the stove like the meat version. Start by dicing your onion and garlic and sauté over medium heat in the coconut oil until they become translucent and then add your serrano chilies. Make sure to deseed the chilies unless you really want some spicy food! If you can’t get serrano chilies, you can always substitute with jalapeños. Next add your jackfruit and heat about five minutes or until it gets nice and hot. If you haven’t already started shredding the jackfruit when you removed it from the can, you can start now by using the edge of you spatula. As it gets warmer, it will get easier. Don’t worry about getting it completely shredded, the tougher parts will add texture to your dish. Next add orange juice, soy sauce and liquid smoke and mix well. Add remaining ingredients and mix well again so they are evenly distributed. Let the jackfruit sit and simmer in the pan until all the liquid has dried up. I like to leave it on a little longer to brown the outside. Serve your finished vegan jackfruit carnitas by serving on corn tortillas with cilantro and avocados and your favorite salsa. 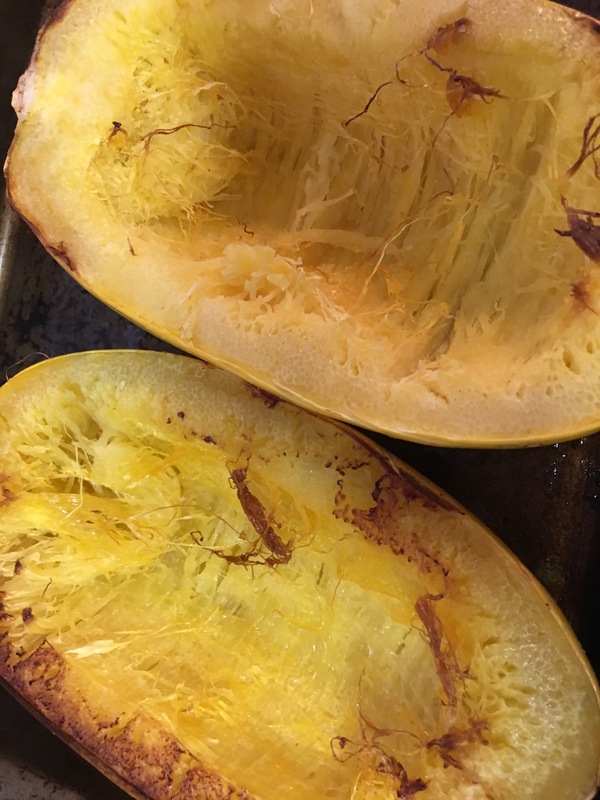 Cut Spaghetti Squash lengthwise with a sharp knife and scoop out the seeds and other loose filling so all that is left is the firm meat. Preheat oven to 350 degrees and lightly grease baking dish as well as the inside of the squash. I used coconut oil cooking spray so I could evenly distribute the oil without using too much. This also helps keep the calories down since this is a very healthy substitute to other very fatty casseroles. Place the squash flesh side down on the baking dish and place in the oven for about 40 minutes. Check to see that it is fully cooked by sticking with a fork. If the fork goes in easily, it is ready to come out, if not, leave in for another 5 to 10 minutes or until forks slides in easily. Once the squash cools enough to handle, scoop out the flesh and place in the mixing bowl. Mix in the Ricotta cheese, thyme and salt and mix well. Lightly grease a 9×9 inch casserole dish and pour the squash mixture. 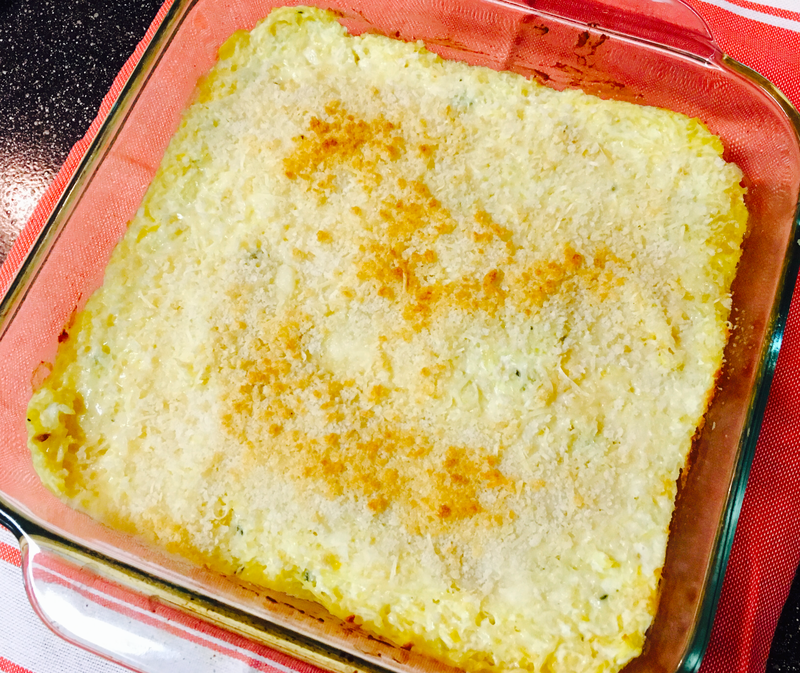 Grate the Parmesan Cheese and evenly cover the casserole. On top of the parmesan evenly cover the casserole with the panko crumbs. Place in the preheated oven at 350 degrees for 20 minutes. Turn oven to broiler setting and broil for two minutes or so, watching very carefully as the panko crumbs brown. Don’t let them burn. Remove immediately after they turn golden. 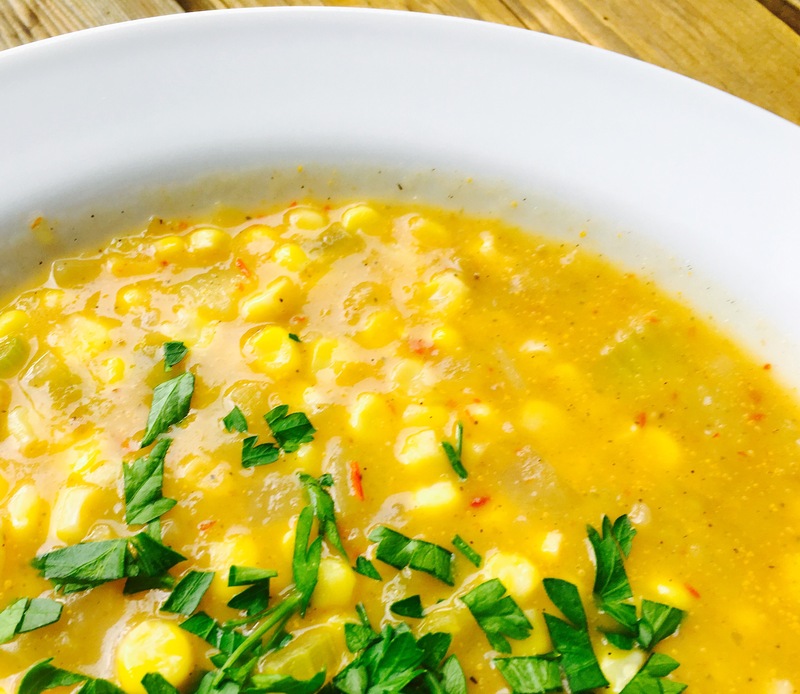 Now that fall is finally here, it’s time to start eating warm soups again on chilly nights. 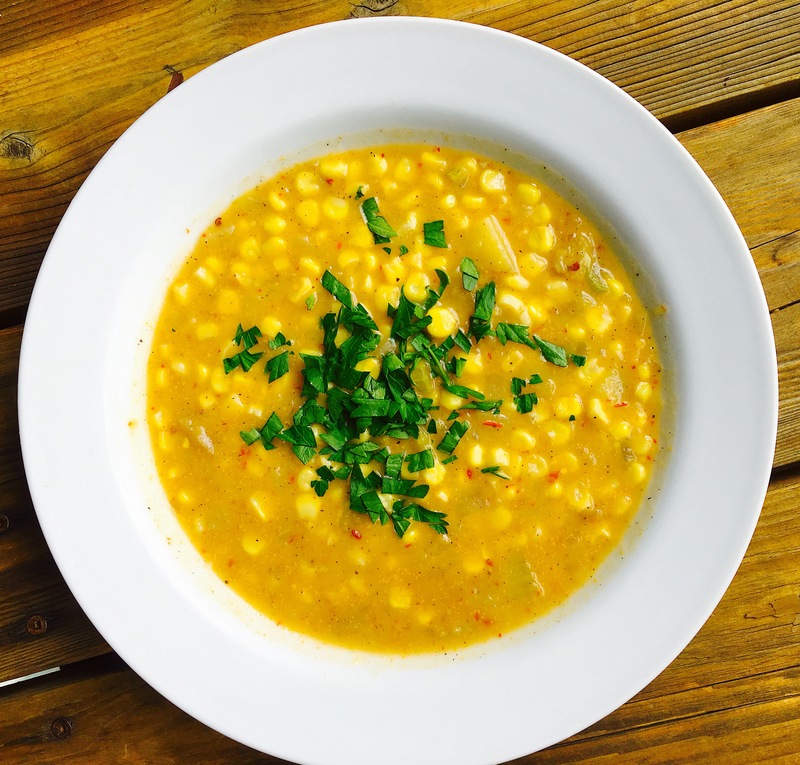 It’s time to start cooking with the famous fall harvest vegetables too, like corn! I made this soup so it would be spicy and warming and using one of my favorite fall crops. A cup of this soup is not an appetizer but rather an entree. It will fill you up and give you enough energy to get through the season of preparing for Halloween, cooking for Thanksgiving and shopping for Christmas. Heat oil at medium high heat and saute onions, garlic and celery for about five minutes or until the onions become slightly translucent and the celery has begun to soften. Add the potatoes, corn, water, salt and pepper and cover. Reduce heat to medium low and simmer for about fifteen minutes or until the potatoes and soft. Place about 3 cups of the soup in the blender or food processor along with the chipotle chili and non dairy milk and roughly blend. Mix with the remaining soup and serve immediately. Garnish with parsley or cilantro for a more southwestern flavor. 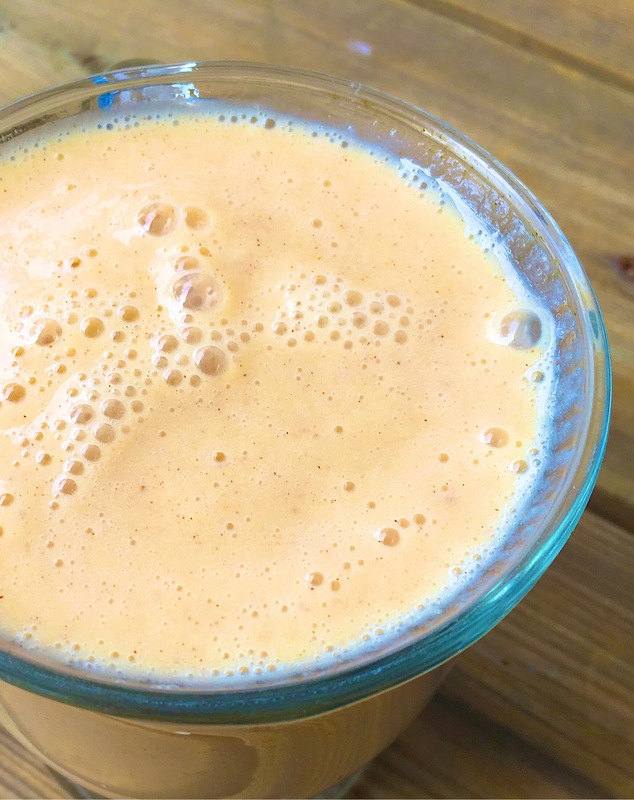 I’m in love with this new smoothie that I thought of this morning and am drinking as I write. Autumn began yesterday here in Portland as the weather changed and it poured rain all night. I felt like I wanted something that was autumn like, and that contained those favorite ingredients like cinnamon and nutmeg. Instead of the tried and true combination of pumpkin and spices, I had frozen peaches in my freezer. Here’s what I came up with and I dedicate it to the changing of the season, with a little summer and a little fall. Place all ingredients in a high speed blender and blend well.